One part of our nervous system gives us more energy when we need it. This part is called the sympathetic nervous system. Another part helps calm us down when we are too excited. This part is called the parasympathetic nervous system. When you get upset, nervous, or anxious, you can trigger your parasympathetic nervous system to calm yourself down. This activity will teach you a simple technique called 5-5-5 breathing. Your Turn Try 5-5-5 breathing. Follow these steps. Wait for 5 seconds: 1-2-3-4-5. Repeat the process three more times (1 minute total). 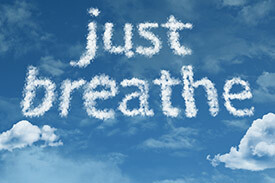 Using 5-5-5 Breathing to Calm Down by Thoughtful Learning is licensed under a Creative Commons Attribution-NonCommercial-ShareAlike 4.0 International License. Based on a work at k12.thoughtfullearning.com/minilesson/using-5-5-5-breathing-calm-down.